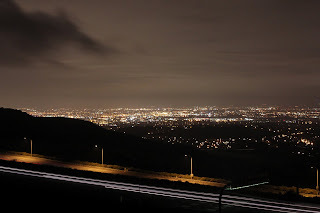 I just got back from a night hike on the Pacific Ridge Trail in Newport Beach. We parked at the trailhead which starts at the end of Vista Ridge Road in Newport Beach. The trail is actually a horse trail, so its a lot wider and smoother than a lot of the trails in the area. We followed it for about 2 miles. It runs gently up and down a few small hills with an a negligible elevation gain. The neighborhood next to the trail is modeled after a Mediterranean village and its probably the most beautiful neighborhood in all of Orange County. I took a few pictures but they don't do it any justice. The moon was out and it was bright enough that we didn't even need a headlamp or flashlight. This trail looks great for mountain biking during the day and it intersects the trails in Crystal Cove State Park, so I'll definitely be coming back. The photo I posted is the view facing Irvine where route 73 runs along the ridge line.